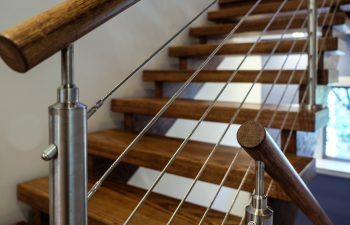 Cable railings have been used for years because of their strong and durable nature, but in recent years, they have been heavily adopted into the staircase and exterior railing market. This is due to their ability to blend in with their surroundings and offer and unobstructed views of your surroundings. They are transforming the staircase market; never before has a railing system been able to transform a staircase into a piece of modern art as subtly as cable railings can. In this week’s blog, we take a look at some of our projects that involve cable railings and discuss why they are becoming so popular. 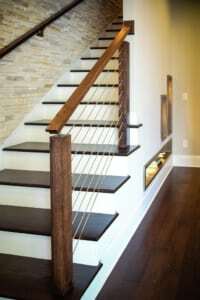 Our first featured staircase shows how cable railings can be a perfect addition to any staircase. 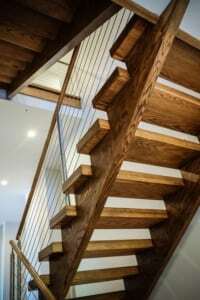 As shown here, the railing compliments the traditional wood straight staircase, but also adds a flare of modernity. Our second featured staircase displays the popular combination of an open riser staircase and cable railings. This allows the homeowner to see unobstructed views of the home and implements a sleek and modern look. 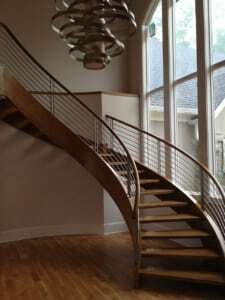 Next is a unique curved staircase that utilizes cable railings to create a look of contemporary sophistication. Our final featured project is an outdoor balcony that uses cable railings to offer a clear view of the horizon and enhance the railing’s modern look. Visit our cable railing system gallery to view additional product photos and details. Cable railing systems offer a sleek, modern look to enhance any staircase or balcony. 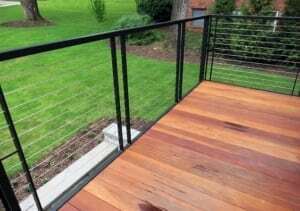 With clean lines and outstanding durability, cable railing systems are an excellent choice for contemporary projects, both interior and exterior. With over 30 years of experience, our team has delivered top quality cable railing systems from coast to coast. Our team of experts works collaboratively with homeowners, builders, designers, and architects throughout all phases of design and delivery. From inspiration to installation, our industry leading team will support you. Contact us today to discuss your next project.